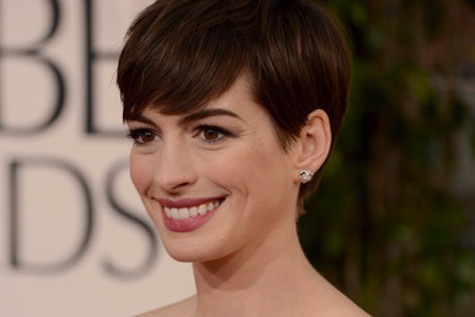 Posted on January 13, 2013 by Liz K.
I’d like to tackle a truly polarizing topic: Anne Hathaway. She probably uses words like “brave” to describe acting. I can’t tell you how much that feeling resonates with me. My grade school self, my high school self, my college self, my career self. So what about her, guys? A few years later, she’s on top of her career. She’s alive. She’s happily married. She is a Golden Globe winner. She will most likely be an Oscar winner in a few short weeks– all for a part that let her theatre geek nerd light shine, unapologetically (in a film that Beef would like to point out only got a 63 on metacritic). She cut off her Princess Diaries hair. She literally starved herself on lettuce leaves to look like she was dying. She worked really, really hard, the way she wanted to– and it’s paying off for her. She’s super happy and super proud of herself. And she super should be. And yet, if you Google “Anne Hathaway Annoying,” your computer will crash with a bajillion hits. She’s still nobody’s darling. I mean, “Thank you for this lovely blunt object that I will forever more use as a weapon against self-doubt”??? COME ON! Nerd alert! 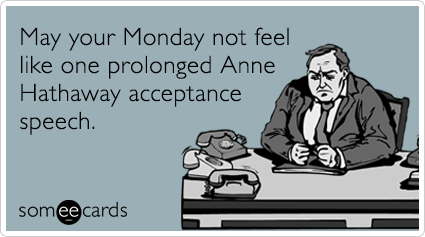 In fact, it is the very fact that I find Anne rather abrasive and self-important that I respect her so much. F those Brokeback Mountain cool kids. She did it on her terms and did what made her happy and didn’t care what anybody else said or did. And that, my friends, is kinda brave. This entry was posted in Celebrity, Current Events, Movies, Television and tagged anne hathaway, golden globe, les mis by Liz K.. Bookmark the permalink. I have always had a take her or leave her attitude about Anne (don’t forget the “E”) Hathaway, but after her Globes speech, I’m in the “leave her” camp. She can act, but it seems like she can’t stop–her acceptance speech, in my opinion, was delivered as an actress. I was so embarrassed for her, I wanted to change the channel, but like a train wreck, you can’t look away. I thought her line about blunt object…self doubt was quite lovely. But, then she kept talking–I mean performing–and she ruined it. I probably wouldn’t have minded her speech, as full of herself as it was, if she actually stopped being an actress long enough to give it. And, if as an actress she wanted to convince us that she was so shocked by her win and humbled, she failed. This was one time she should have tried just being a person. She seems more like a person in her movie roles than in giving her speech. Go figure. I did not find Anne Hathaway brave and I bet she’s crying her eyes out today that all the “cool kids” are picking on her. She cares. In fact, her speech, to me, proves she cares too much. At any rate, I did not care for her dress either. Very mother of the bride style with a bride’s white color. Was that to remind us that she just got married? Yay for Anne. She’s very calculating (that speech was rehearsed a million times, I’m telling you). It’s funny, I didn’t know much about her as a person until recently (if watching a bunch of interviews with her can be considered as “knowing her as a person”, a bit ridiculous, right?) and thought her a very decent actress and a great dresser. Her recent interviews and the Golden Globe speech were a huge turn off for me. What I didn’t like about the Golden Globe speech was how ‘actressy’ and absolutely non-genuine it was, compared to say Lena Dunham’s absolutely genuine speech. I also found it a bit ungrateful to mention her cinematographic debut as the princess of Genovia (??) as something almost shameful that she is glad to have had the opportunity to escape from. Another turn off. she bugs the crap out of me but I totally respect your defense of her. LOVE the cool kids though! !